How old is the oldest ancient Indus writing? The earliest examples of Indus writing are from the Early Harappan Kot Diji period, which at Harappa is dated to c. 2800-2600 BCE. While most of the graffiti from this phase are not writing in the real sense, there are some real inscriptions probably dating from the late phase of this period. The Indus script emerges out of earlier writing systems that date to around 3300 BC or even earlier. The Ravi Phase at Harappa (3800-2800 BC) has the earliest evidence for signs that eventually were used in the later Indus Script. During the Kot Diji Phase at Harappa and other sites there is widespread use of what can be called Early Indus Script. The Indus Script begins with the Harappa Phase (2600-1900 BC). There are three phases of Indus script and seal use based on excavations at Harappa and other sites. The Indus writing in its fully developed form can be dated to about 2600-1900 BC. However, we do find precursors to the full-fledged Indus script in the form of pre-firing potter’s marks or post-firing graffiti before this period (~ 3300 BC). For earliest evidence of writing in the Harappan Civilization, please see (Kenoyer, J. M. 2006, The origin, context and function of the Indus script: Recent insights from Harappa, in Proceedings of the Pre-symposium of RIHN and 7th ESCA Harvard - Kyoto Roundtable, ed. Osada Toshiki). This depends on how we define an "Indus inscription"; the most complex sequences of signs on pottery found by J. M. Kenoyer at Harappa currently might claim this status. 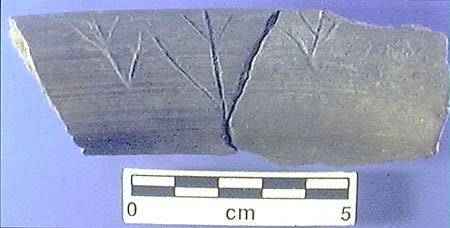 The oldest evidence of writing on pottery etc. is provided by Kenoyer and is dated to about 3000 BC in the form of markings on pottery etc. Above: Earliest known inscribed Ravi sherd.